Sanford Calvin Yoder was born 5 December 1879 to Christian S. and Anna Swartzendruber Yoder, near Iowa City, Iowa. In 1903 he married Emma Stutzman from the same community. Their three children were Myron, Marguerite, and LaVerne. 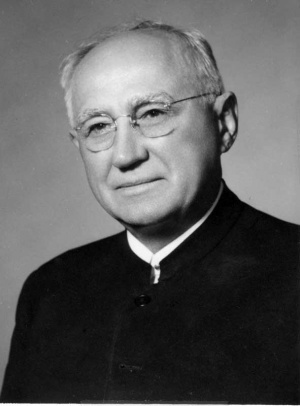 Yoder graduated from the Clarion, Iowa, high school (1901) and Hamilton College of Law (LLB, 1926), University of Iowa (BA, 1927), Winona Lake School of Theology (MA, 1933), Northern Baptist Seminary (BD, 1934; DD, 1937), and Gordon College Divinity School (STD, 1939). He taught in the public schools of Iowa and Washington. In Washington he was also a rancher. Yoder was ordained to the ministry in the Mennonite Church (MC) at Chappell, Nebraska, in 1911. When he returned with his family to Kalona, Iowa, in 1913, he was ordained bishop at the East Union congregation. His most significant work was as secretary of the Mennonite Board of Missions (MC), 1921-1944, and as president of Goshen College, Goshen, IN (1923-1940). His statesmanship and leadership served as a reconciling influence in the Mennonite Church (MC) during the troubled decade of the 1920s and the years following. He died 23 February 1975 at Goshen. Burkholder, J. Lawrence, ed. An Evening to Honor Sanford Calvin Yoder. Goshen College, Goshen, IN, 1974. Goshen College Bulletin (July 1975). The National Cyclopedia of American Biography, vol. 59. Clifton, New Jersey, 1980. Umble, J. S. Goshen College, 1894-1954. Goshen College, Goshen, Indiana, 1955. Warkentin, A. and Melvin Gingerich, compilers. Who's Who Among the Mennonites. North Newton, KS: Bethel College, 1943: 287. Yoder, Sanford C. The Days of My Years. Scottdale, 1959. Smth, Willard H. "Yoder, Sanford Calvin (1879-1975)." Global Anabaptist Mennonite Encyclopedia Online. 1989. Web. 22 Apr 2019. http://gameo.org/index.php?title=Yoder,_Sanford_Calvin_(1879-1975)&oldid=104888. Smth, Willard H. (1989). Yoder, Sanford Calvin (1879-1975). Global Anabaptist Mennonite Encyclopedia Online. Retrieved 22 April 2019, from http://gameo.org/index.php?title=Yoder,_Sanford_Calvin_(1879-1975)&oldid=104888. Adapted by permission of Herald Press, Harrisonburg, Virginia, from Mennonite Encyclopedia, Vol. 5, p. 951. All rights reserved. This page was last modified on 8 December 2013, at 12:36.